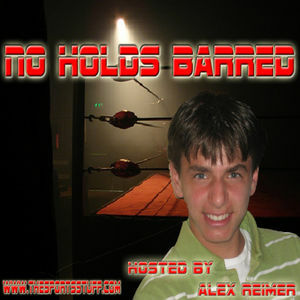 Alex Reimer has been hosting “No Holds Barred” since October of 2005. Alex also hosts a Red Sox podcast titled, “Without a Curse,” and has been profiled in The Boston Globe, as well as been a guest on both “The Today Show” and “The Tonight Show” for his work in the podcasting field. Alex has very strong opinions, and is not afraid to share them! Each episode features Alex giving his witty, entertaining, and informed insights on the wrestling world. Interviews with wrestling journalists and wrestlers themselves are not uncommon either. “No Holds Barred” is published every Friday. WWE: Has The Company Become Too "Conservative?" This is it...the final scheduled edition of "No Holds Barred." Thanks to all who have listened these past 6 years, the show would not have been possible without all of you. Thanks also go out to all for understanding my decision to discontinue "No Holds Barred." It was a very difficult choice to make. In this episode, I touch upon the past week of WWE TV, including the difference in how CM Punk was portrayed on RAW and Smackdown. Alberto Del Rio being stuck in Mexico, where Christian goes from, Randy Orton vs. Mark Henry, and much more is discussed too. The bulk of the episode, however, is spent discussing some "big picture" points. Has Vince McMahon's approach to the on-air product become conservative, even though his business approach remains anything but? Also, stemming from Matt Hardy's "fake" suicide video on youtube this week, it's very clear that something drastic has to change in the wrestling business. It's difficult to be bigger than the addiction when the lifestyle is bigger than you. Thanks again go out to all who have listened over these years. Please keep in touch via email (Alexredsox076@aol.com), on twitter (@AlexReimer1), and on facebook. I don't want to lose touch with any of you. As you know, I'll always have something to say ;). "Without a Curse" will continue here on www.thesportsstuff.com...I'm taking next week off but will return on Monday, 9/12. "The Alex Reimer Show" returns to the airwaves on Saturday 9/10 from 2-4 PM EST on WGAM 900 AM Nashua, 1250 AM Manchester, and www.wgamradio.com. Triple H Needs To Get Over More...REALLY?!?! Jim Ross: Is He Back On A Full-Time Basis?